We have discovered a bug with regards to absolute unique items. One player has already lost his Shining Crystal Set while teleporting. 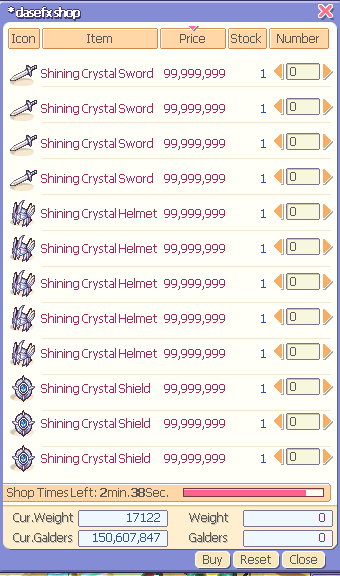 We can't fix this bug now, and because of the risk it poses to server stability, GM has decided to wipe out ALL absolute unique items (Shining Crystal & Fallen Watcher items) from the server in next maintenance. If you have absolute unique items, here's what you can do before next maintenance in February 2019: Sell each absolute unique item you have to me for 25,000,000 galders each (25 million galders). You can put the item in AH and send the link to my forum account here. 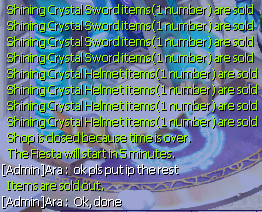 Any absolute unique item not sold to me or not bought by me will be gone in next maintenance. Change of plan (sorry about that): You can't sell through AH. I believe Coder has disabled AH function for absolute uniques now. So, before wiping out the items in next maintenance, you will be compensated 25mill 100mill galders per item to your char that holds any absolute unique item. We will not publish absolute unique items until we could fix the bug. We don't know when we could fix the bug. If/when we fix the bug, we will let you know. p/s ~ if you have friends in game having absolute unique items, please let them know of this announcement. That's really nice but I just noticed that someone got 99m per absolute unique instead of 25m as you told us here! You are right. Ok, I'll give him same amount. I'll make arrangement with [Mod]Hiroto about it. It doesn't worth 100m but ok, it's aran's choice. I agree it doesn't worth 100m each though I have some in my inventory. Btw, If someone has most of Unique Items on purpose like this, It's much harder for another players to get those from hunting monsters. I don't know exact reason why someone gathers most of UIs but I think it has a bad influence on the game play.